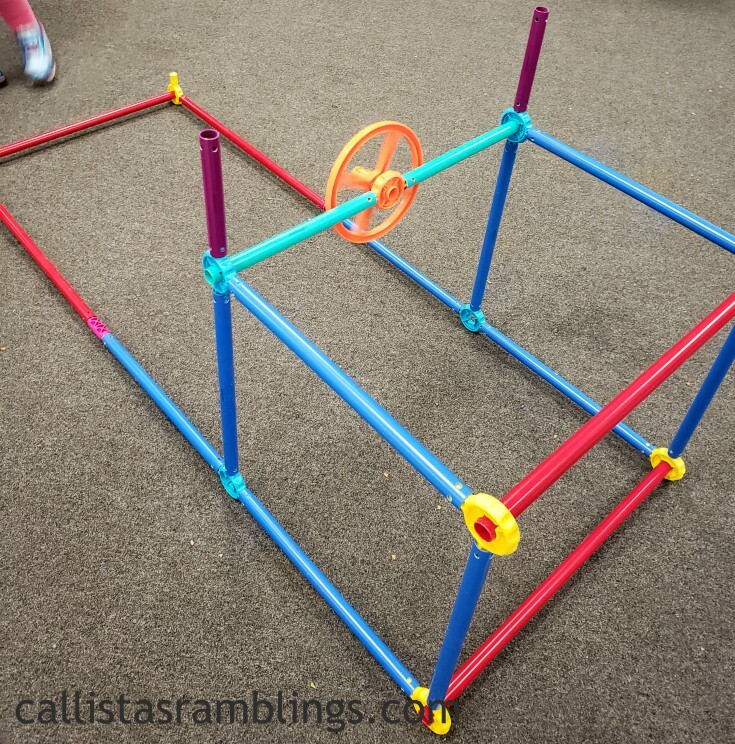 All kids like to create forts and play in them but the company Antsy Pants has just made things a whole lot easier. Not only can you build forts but you can build tents, lemonade stands, pirate ships and buses. You can use the Build and Play Connector Kit to get started. It has 78 pieces including poles of different sizes and different types of connectors. You can build your own fort and throw blankets over it for a quick fort. 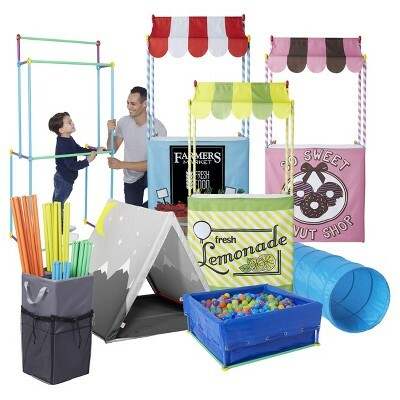 Alternately you can buy a cover separately to instantly make a play house, puppet theater, ice cream truck, tent or pirate ship. There are also all in one kits like the one we tried out below, the bus kit. These kits come with poles and the cover that you need specifically for that particular build. 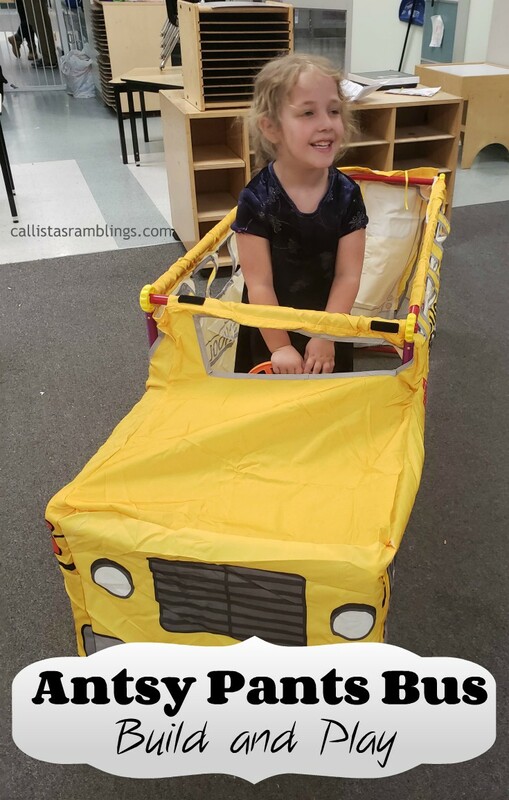 Since my house is small I donated the bus to my daughter’s Kindergarten class and went in after school to assemble it for them and take photos. Disclosure: We received some items from Antsy Pants in exchange for this post. All opinions are honest. The above photo shows the finished result. 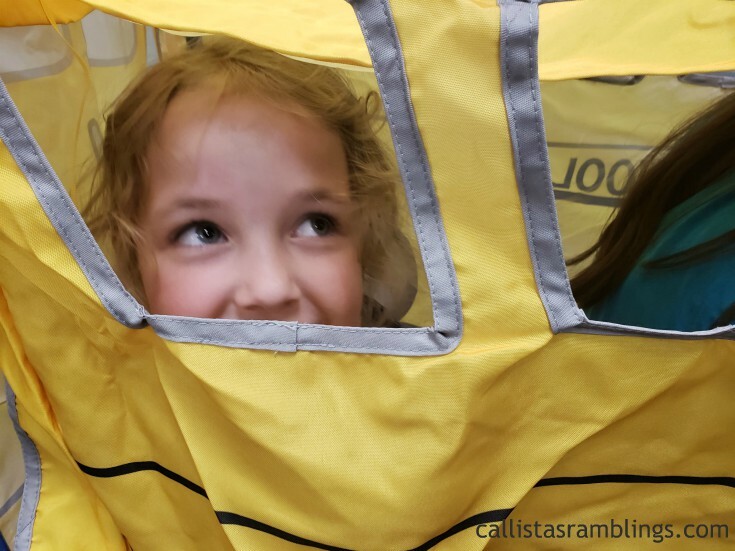 Their is a roof as well that can be attached with Velcro or rolled up and out of the way if your child prefers to stand up. My daughter is 4 and so the bus would be perfect for two kids her size but would work up to four. My 12 year old climbed in with her too but wouldn’t let me show the picture. So it’s pretty roomy. First things first though, we opened the box and using the included guide, started assembling the poles and connectors. My daughter helped by passing me certain pieces. As you can see below the pieces are colour-coded which helped with assembly. The bus includes a steering wheel which turns too. The poles just slide onto the connectors and mostly pop into place. A few had to be turned to get it right. After all the pieces were connected we just had to slide the cover on. Then you disconnect a few poles, slide them through the fabric and connect them back on. So once it’s set up, you don’t have to worry about the cover sliding off again. As I said above the roof can be attached or not, however you want it. It’s easy to change so your child can do it themselves. In the picture below the roof is sagging a bit but that is because I forgot to attach the back pole through the fabric. As you can see there are 4 windows on each side. It’s not visible but there is a flap door on the back of the bus to allow the kids to get in and out as they want. 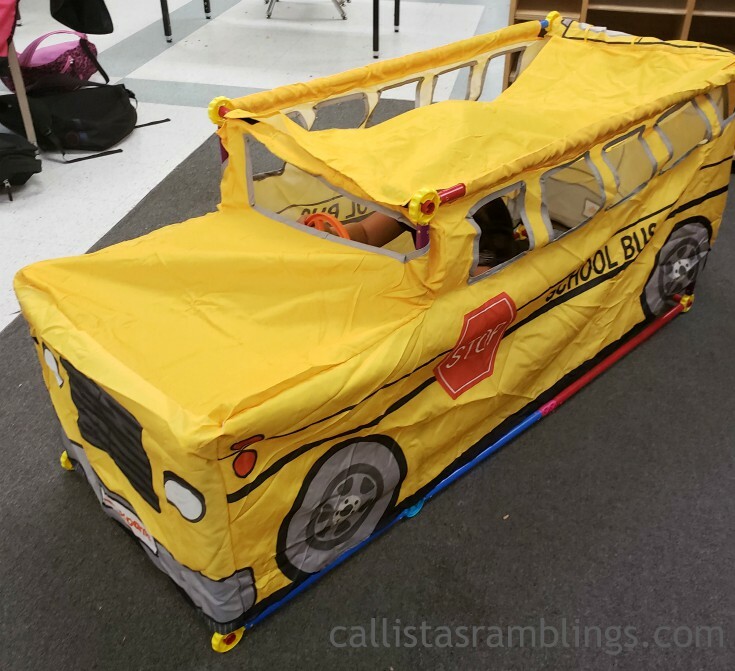 My daughter and her classmates LOVE this bus and although it’s perfect for her class, would work for any home that has the room in a bedroom or play room. I wouldn’t say assembly was simple enough that I’d want to put it up and take it down daily but if you wanted to have it up for a few weeks and then take it down for a bit to alternate with another toy that would work fine. Now that I’ve shown you the bus I want to tell you about the other options I mentioned. This photo shows you just some of them. You can check out all of them at the Antsy Pants website. Antsy Pants products are now available at Indigo Stores in Canada. Please note not all the products in the Antsy Pants website may be available at Indigo.